Belgium-based FN Herstal, one of the world's leading firearms manufacturers, has developed a new comprehensive FN® Airborne Digital Suite to meet challenging market demands and expectations on integrating machine guns into modern platforms. The FN® Airborne Digital Suite provides military forces with the highest level of operational capability. This new fully digital ITAR-free suite is fully in line with FN Herstal's strategy to further develop its customizable Integrated Weapon Systems for Airborne applications. FN® D-HUD (Digital Head-Up Display): a modern and cost-effective targeting solution to improve precision in firing. It enhances accuracy and situational awareness and reduces the pilot workload. This Digital Head-Up Display is easy to integrate, ergonomic and equipped with high-end optics technology and ballistic computation solution. The FN® D-HUD offers capability to retrofit in-service helicopters to the latest advances in targeting technologies. The brand new FN® D-PC (Digital Pod Controller): this new FN Herstal Armament Management System (AMS) is designed to control digital pods and rocket launchers. 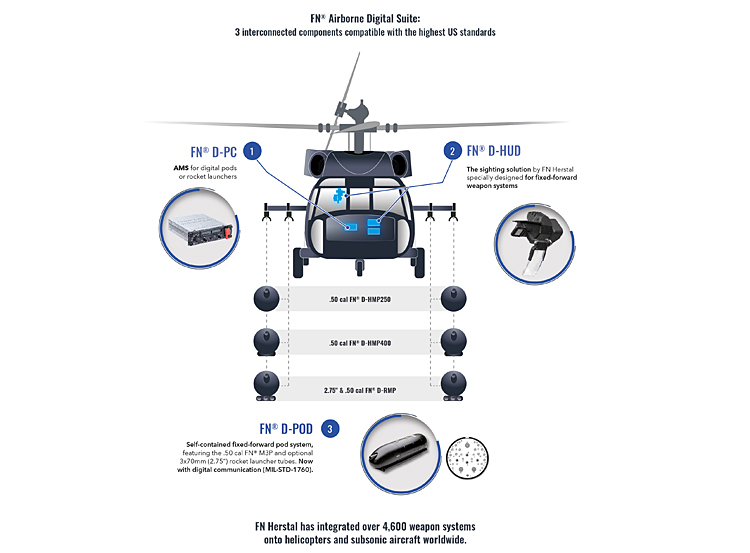 The FN® D-PC is installed on the platform and is connected to the pods via MIL-STD-1760 compliant protocol. The FN® D-Pod: a self-contained fixed-forward pod system, featuring the well-known .50 cal FN® M3P machine gun, now with digital communication. The FN® D-Pod can be operated by either FN® D-PC or on-board non-FN Armament Management System. It allows rapid reconfiguration of helicopters or subsonic aircraft between missions. The FN® Airborne Digital Suite belongs to and takes benefit of the comprehensive range of FN Herstal's integrated weapon systems based on 4 pillars: Airborne Fixed-Forward Firing Solutions, Airborne Crew Served Weapon Solutions, Land and Sea Mounted Weapon Solutions and Remote Weapon Stations. The FN® Airborne Digital Suite is showcased at Farnborough International Airshow, Hall 1, Belgian Pavilion, FN Herstal's booth 1395, July 16-21.